Global K-pop sensation BTS’ upcoming concert film “Love Yourself in Seoul” has topped Korea’s box office this week, after ticket presales started last Wednesday. According to the Korean Film Council on Monday, presales exceeded 152,956 over the weekend, more than 60 percent of all box office sales in Seoul. 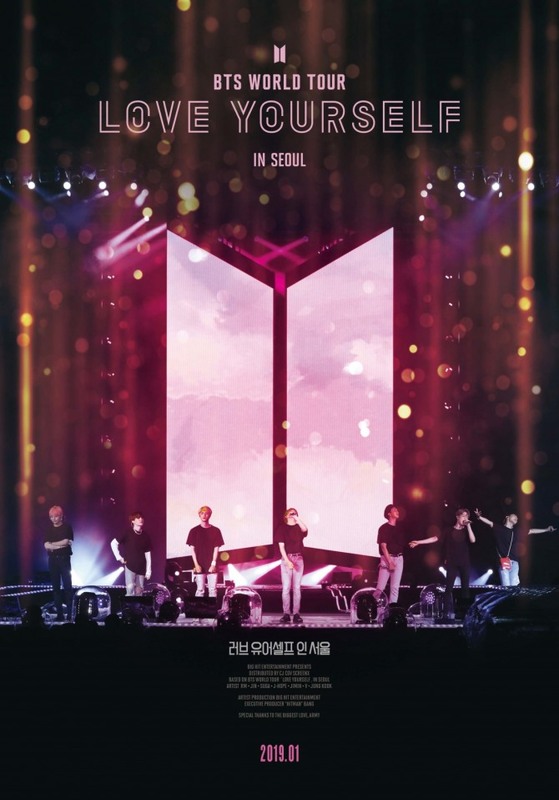 The movie features the kickoff concert in Seoul that launched the seven-member boy band’s “Love Yourself” world tour, which has encompassed 20 cities around the world since August last year. It will premiere worldwide Jan. 26, and in Korea it will be shown at CGV theaters only. Expectations are especially high for the panoramic ScreenX version, when the screen will extend onto the side walls for more immersive 270-degree viewing. Prime-time tickets for sing-along theaters, where the audience is allowed to sing with the band, are already sold out. Tickets cost 15,000 won (US$13.30) for the ScreenX theaters on weekend. “It took three days for BTS’ previous ‘Burn the Stage’ film to sell 100,000 tickets. But this time, the same number of tickets sold out in just one day,” a CGV representative told The K-pop Herald, saying the chain would schedule additional screenings in response to soaring demand.